The Innovative Product Program at GlassBuild America®, where exhibitors qualify their product in the areas of Solar Integration, Efficiency, Dynamic Products, Sustainability, High Performance and/or Design Innovation, has grown 218% since its debut just 3 years ago. Who sees that kind of increase these days? Whether or not you attended GlassBuild America this year, we, along with our official publications, Glass Magazine® and Window & Door®, are committed to keeping you informed about the new and exciting products available in our industry. This information can make a significant difference for your company and its future. Visit GlassBuild America’s Innovative Product Page and select the companies that displayed innovations for both commercial and residential window and door markets. Whether you are buying, selling, or just hanging tight, you need to know “what’s next”! This important venue within GlassBuild America will continue to grow, so mark your calendar for September 12-14, 2012 and join us in Las Vegas! The 2011 edition of GlassBuild America is in the books and it will be remembered for many things including its amazing exhibits, some of which were awarded “Best in Show”, and its positive crowds throughout the 3-day event. Exhibiting companies from all over the world displayed some of the most innovative and exciting products available on the market today. The annual GlassBuild America Welcome Reception, co-sponsored by Quanex Building Products and NGA was a huge success with nearly 900 people packing the ballroom, proving that this event is the absolute best networking opportunity around. GlassBuild America 2011 will also be remembered for the incredible educational opportunities and professional forums that took place. The Glazing Executives Forum kicked off the week with a powerful keynote speech by Serious Energy CEO Kevin Surace. His insights had attendees buzzing long after the event was complete. The 1st Annual NGA Architects Forum offered an eclectic group of speakers and highly rated education. This new program is sure to grow and will be an absolute must for architects to earn education credits in the area of architectural glass. Headlining speaker Edward Mazaria did not disappoint as his presentation not only energized the crowd, but was relayed worldwide on several Twitter feeds. Wednesday, 3 seminars took place beginning with a standing room only Building Integrated Photovoltaic event, followed by updates on Decorative Glass and Window & Door Performance Standards. Overall, the education opportunities provided at GlassBuild America delivered! GlassBuild America would like to thank all participants for recognizing the value of seeing and learning about current products, networking with other industry professionals, and taking advantage of important updates provided at our seminars and forums. We also appreciate the support and commitment of our exhibitors and sponsors that help provide participants with a “not to be missed” experience year after year. 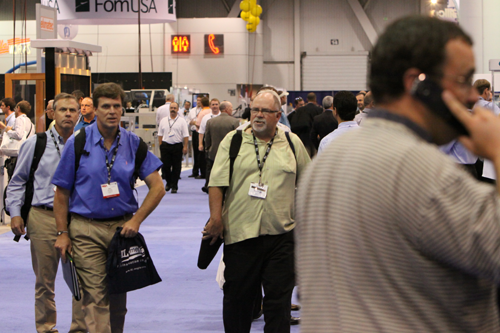 Next year GlassBuild America returns to Las Vegas, NV – September 12-14. We’ll keep you up to date throughout the year with e-updates, product spotlights and more as we gear up for THE SHOW OF SHOWS in Las Vegas. Also continuing coverage of GlassBuild America can be found on our website www.glassbuildamerica.com and our twitter feed @glassbuild. Bookmark and follow us today! 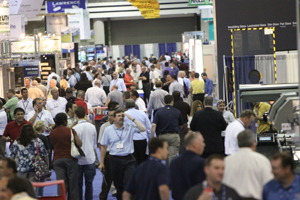 Wednesday, The Final day allowed attendees and exhibitors to wrap up a successful 2011 GlassBuild America. For those of you who missed out on coming to Atlanta, here’s a look at some of the color and excitement on the floor! 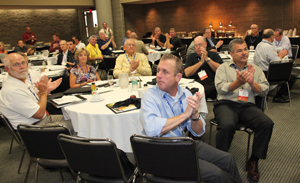 The morning seminars closed out GlassBuild America’s educational offerings. The Building Integrated Photovoltaic’s session was standing room only and attendees heard some amazing statistics about the continued growth of Solar materials. The other two seminars, Decorative Design process and Performance Window & Door specifications were also well attended and featured very lively and beneficial dialogue. Also the first annual “Best in Show” winners were announced today. Out of 393 booths on a sold out floor, the voters selected the following exhibits as the Best in Show. Here are the winners by category classification. Congratulations to all of our winners! Winning this year was an accomplishment with a trade show floor stocked with fantastic efforts. 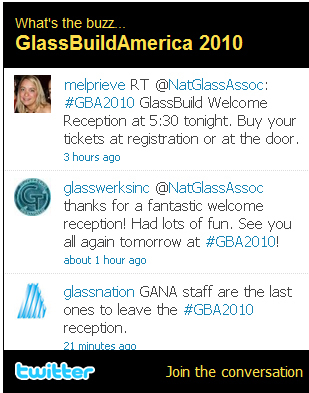 Visit GlassBuild America.com and GlassMagazine.com for additional show wrap-ups and follow us on Twitter. When you tweet, use the #GBA2011. “We had a busy summer, we’re busy now and it looks like a busy fall,” said John Dwyer, president of Syracuse Glass who was one of more than 6,000 attendees visiting GlassBuild America on Day 2. And while a busy fall forecast may not be shared by all glass companies across the country, there was a sense of determined action on the part of attendees and exhibitors alike. Tough times require “out of the box thinking” is how another industry veteran put it, and more than one exhibitor was showing how. “We’re here to solve people’s problems,” said Doug Canfield, president of Casso-Solar Technologies LLC as he explained how his engineers help solve the quick turnaround and added-value demands of today’s marketplace. Upstairs, Window & Door Dealers Forum attendees learned valuable tips to help improve their businesses from both speakers and each other at the session’s roundtable discussions. The first-ever Architects Forum featured the hottest architect— Edward Mazria, energy expert, educator, author and Architecture 2030 founder; who delivered an eye-opening presentation illustrating the powerful role of the Building Sector in both creating and alleviating many of the crises facing America and the world today. It was a huge success. Visit GlassBuild America website, GlassMagazine.com and Wednesday’s WDweekly for more show updates and follow us on Twitter. When you tweet, use #GBA2011. The Dow and GlassBuild America are Up! 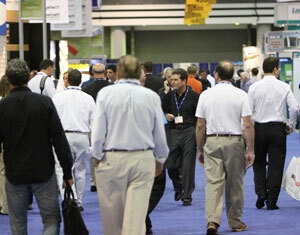 GlassBuild America’s sold out show floor opened to a solid crowd of buyers today, Monday, September 12. Industry innovation is alive and well and 393 companies—including 73 first-time exhibitors– in 1,230 booths are here to show it. To recognize and reward that effort, attendees—who are eligible to win one of four $50 AMEX cards–are voting for “Best in Show Awards” for the first time. Voting cards are being dropped off at booth #1015 or in the M3 Networking Lounge through Tuesday afternoon; winning exhibitors will be announced on Wednesday. The core message delivered by Dr. Jeff Dietrich at the Sixth Annual Glazing Executives Forum: Embrace risk in the face of uncertainty. “If you are waiting for certainty, you are going to be way behind and lose the game,” Dietrich told his audience. American can-do spirit was in full swing at the Welcome Reception where 850 attendees and exhibitors mingled after the show closed its first day. David Petratis, President & CEO of Quanex, kicked off the best-ever attended reception with a forceful and positive take on the future of the industry and America. Up Next: Tuesday’s Window & Door Dealers Forum, the first annual Architect’s Forum, Live Impact Demos and more stunning booths to visit and vote on. Follow us on Twitter and when you tweet, use the #GBA2011. Who was Today’s Mystery Exhibitor? 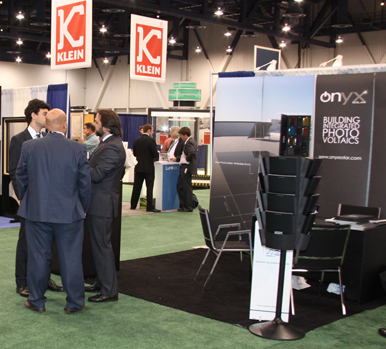 Klein USA in Booth #445 was today’s Mystery Exhibitor. The lucky attendee who will receive $100 in cash is John Nagler from Portal Doors & Partitions in Whittier, CA. 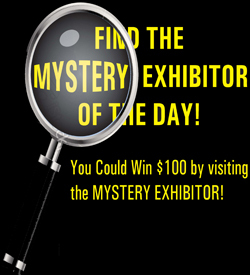 The final Mystery Exhibitor clue for tomorrow is “Thursday’s Mystery Exhibitor is a 2010 Crystal Achievement Award Winner!” Make sure to visit all the exhibiting Crystal Achievement Award Winners for your chance to win $100! 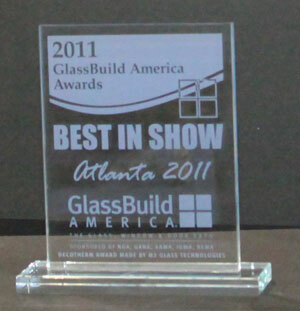 Hint: Crystal Achievement Award winners are listed in the Glass Magazine and Window & Door. Pick up your copy of both magazines in the NGA Publications Booth #1857. “We are a company from Spain and just opened a branch office in New York City. We have had a lot of people stop by the booth excited with the products that we develop because it is very innovative and the [solar] market is growing up very fast. We are very happy with our participation in this show.” Diego Cuevas, Onyx Solar Booth# 652. First time exhibitor, Onyx Solar can be found in the Innovations Pavilion in Booth# 652. They will also be participating in tomorrow’s first seminar Solar & Efficiency – Building Integrated Photovoltacis in Fenestration Application. The seminar will be held in room N257. 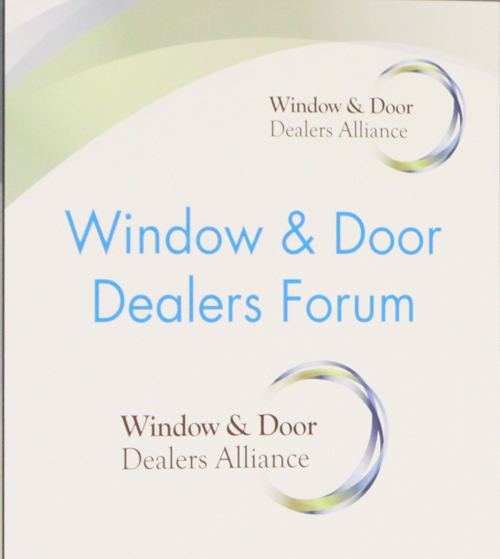 “The Inaugural Window and Door Dealers (WDD) Forum impressed — in outstanding take-away content on best practices on labor, marketing and other management topics. 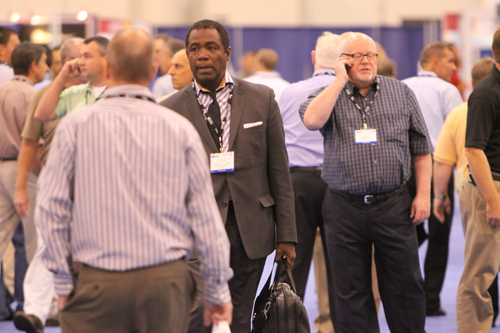 The higher than expected attendance was heartening and provided top-notch dealer networking opportunities. Plans are now underway for the 2nd Annual WDD Forum at GlassBuild America 2011 in Atlanta, Georgia,” stated David Walker, Window & Door Dealers Alliance Booth# 1851. “This is the best show that I’ve been to in a while” stated Rick Nelson, Bohle America, Inc. Booth# 1865. Tomorrow is GlassBuild America’s final day. Thursday starts at 9am with the seminar: Solar & Efficiency – Building Integrated Photovoltacis in Fenestration (BIPV) Applications. This is a “can’t miss” seminar that will dive into the highly interesting BIPV topic. The Solar & Energy Efficiency seminar is followed by a Decorative Glass seminar titled: Is it All About the Product or Design Process? The GlassBuild America show floor opens at 9am, an hour early, tomorrow. Make sure you visit those booths you didn’t get to on the first two days. After 40 years, Don Johnson, will be retiring from the industry. 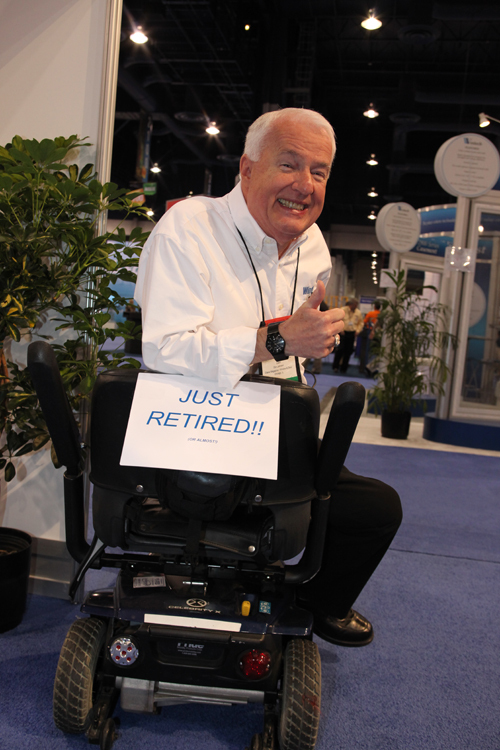 Be sure to wish him well as he scoots around the show floor. Stylmark Inc. in Booth #1268 was today’s Mystery Exhibitor. The lucky attendee who will receive $100 in cash is Russell Bohan from Potomac Glass in Stafford, VA.
Tomorrow’s clue is “Wednesday’s Mystery Exhibitor is in the Innovations Pavilion”. Make sure to visit all the exhibitors in The Innovations Pavilion for your chance to win $100! “Don’ take my word alone”, in the words of one of the nearly 160 attendees at the 5th Annual Glazing Executives Forum, “it does not get much better than this. Relevant. Energizing. Information packed. Best set of breakouts, networking and economic forecast we’ve had.” David Walker, NGA Vice President Association Services.